[Image: Little Earth by London Fieldworks]. Speaking of surrogate earths, the science-minded arts group London Fieldworks has a project, from 2004, called Little Earth. 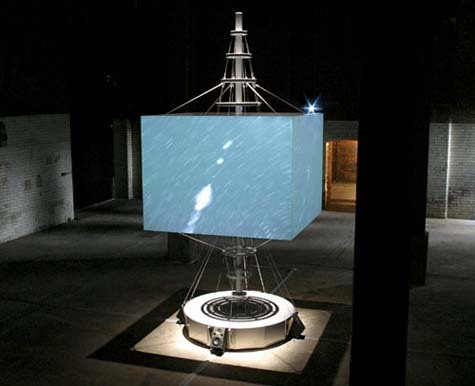 Little Earth was a "four channel synchronised video installation with surround sound," featuring scenes "shot on Haldde Mountain in the Norwegian Arctic, Ben Nevis in Scotland, and on the island of Svalbard, with computer animations of the Earth’s magnetosphere modeled by the Leicester Radio & Space Plasma Physics Group." [Image: Another glimpse of Little Earth by London Fieldworks]. The Independent refers to these latter projections as being "an animated sequence of the Earth enmeshed within its magnetic field lines, which trail off into the solar system." Here are some video stills of the project. [Images: Film stills from Little Earth by London Fieldworks]. Meanwhile, London Fieldworks also produced a short publication about the project; the book includes essays on art, meteorology, and physics. The Little Earth project identifies two physicists, C.T.R. Wilson and Kristian Birkeland, as significant contributors to 'big science'. Both researchers were stationed at mountaintop observatories studying natural phenomena at the end of the 19th-century. They relied on naked-eye observation and simple instruments in extreme environments and were perhaps the last of the natural philosophers. Associated with the mountaintop experiences of Wilson and Birkeland are two celebrated machines: Wilson’s famous ‘cloud chamber’ and Birkeland’s lesser-known ‘terrella’. The instruments promoted understanding of phenomena at the micro and macro scale – signaling new frontiers for exploration. Among many other reasons, this caught my eye because Birkeland and his "terrella" – which London Fieldworks describe as an artificial "plasma universe" – were the subject of one of the very first BLDGBLOG posts... a post which, in an almost freakish coincidence, I was re-reading just this morning, several hours before I discovered Little Earth (via we make money not art). It's an old post, so it's strangely formatted and a little over-casual, but it's also one of my favorites – so check it out if you get the chance. And if London Fieldworks sounds like an interesting group, you'll be pleased to know that there are several other cool projects described on their website. (Note: Little Earth spotted over at we make money not art).